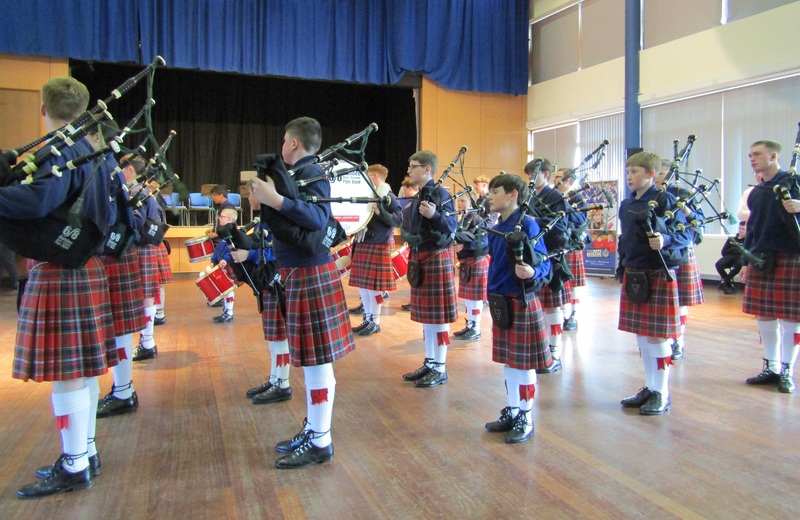 220 members of The Boys’ Brigade participated in the organisation’s Scottish Bands Contest last Saturday afternoon (23 March) at Hutcheson’s Grammar School in Glasgow. The Bands Contest is the Annual showcase and competition event for new and established bands from across the organisation in Scotland. The audience of over 300 people was entertained by brass, woodwind and pipe musicians from across the country. This year’s event welcomed bands from Largs, Troon, Dundee, Monifieth, Bearsden, Wishaw, Johnstone, Kincardine, Port Glasgow and Dunblane. 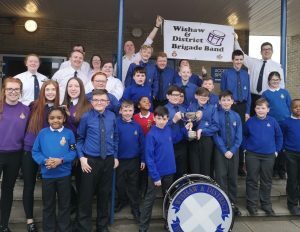 Clinching the Pipe Band Championship trophy was the band from 1st Troon and in the Marching Band Championship class, Wishaw Brigade Band took the title. 1st Bearsden Pipe Band triumphed in the Development Pipe Band band category and the band from 3rd Johnstone won the Marching Band Development competition. This event, which first took place in 1980, also welcomed several members from Girls’ Brigade Scotland. “I’ve learned how to play music from scratch in The Boys’ Brigade. There’s no way I would be able to read music if it weren’t for the opportunities here. I have had great opportunities, such as the bands tour to Germany last year. “This year’s Contest was a wonderful occasion and a perfect demonstration of musical talent and teamwork. Every young person and adult volunteer should be immensely proud of what they have achieved. “Music allows young people to develop both hard and soft skills, providing an opportunity to express themselves, develop their musical talents and also work as a team. I believe it is so important that every young person has access to quality music tuition – in schools and in the community. Red Hot Chilli Pipers’ Craig Munro was amongst the contest’s adjudicators. Craig stressed the importance of events such as BB Bands Contest. There was a wide age range amongst the bands, with some players as young as seven and as old as 18 performing. “I started to learn to play the pipes in BB only a couple of years ago. Having a pipe band is a great opportunity for BB members. The Bands Contest is a really important event because it’s a chance to show how good you are, but also learn on what areas we need to improve on.